The Cayuga were members of a powerful confederacy of tribes of the Iroquois Nation (also and more properly called Haudenosaunee). The confederacy was formed around 1570 of the Mohawks, Oneidas, Onondagas, Cayugas, and the Senecas. A sixth tribe, the Tuscarora, joined later after the confederacy was formed. The powerful assistance and oral skills of a Mohawk wiseman, Hiawatha, and the prophet, Deganawida, known as the Great Peacemaker, initiated the development of this united group of tribes based on peaceful practices and ethical laws. The writers of the American Constitution were strongly influenced by their document called the "Great Binding Law," Gayanashagowa. The Cayuga sided with the British during the American Revolution and most moved to Canada when the British were defeated. Of those who remained, many moved to Oklahoma, where they united with the Seneca in 1937. Today, the small number of Cayuga who remain are located in Ontario, Canada, and in New York State among the Seneca. Although small in number, as has been their way throughout their history, the Cayuga maintain their existence through cooperation with other tribes, notably the Seneca. With the Iroquois Nation as a whole experiencing a revival, evidenced through the reemergence of "Hiawatha's Belt" as a symbol of unity, the Cayuga and their beliefs also survive to continue their contribution to humankind's advance toward a world of peace and prosperity for all. The Cayuga nation (Guyohkohnyo or the People of the Great Swamp) was one of the five original constituents of the Iroquois, a confederacy of Indians in New York. A current spelling of the Cayuga name for "Cayuga" is Gayogohó:no’. The Cayuga homeland lay in the Finger Lakes region, on the land bordering Lake Cayuga, between their league neighbors, the Onondaga and the Seneca. 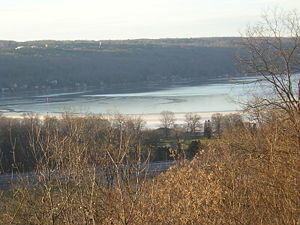 The Cayuga sided with the British during the American Revolution and, after many attacks on American colonists, the punitive Sullivan Expedition in 1779 devastated the Cayuga homeland, destroying major Cayuga villages such as Cayuga Castle (Goiogouen) and Chonodote (known as Peachtown). Survivors fled to other Iroquois (Haudenosaunee) tribes or to Ontario, Canada where they were granted land by the British in recognition of their loyalty to the Crown. On November 11, 1794, the (New York) Cayuga (along with the other Haudenosaunee tribes) signed the Treaty of Canandaigua with the United States. The original five Iroquois tribes were united between 1450 and 1600 by a Mohawk statesman, Hiawatha, and religious leader, Deganawida. Hiawatha went from tribe to tribe speaking for Deganawida who had a speech impediment. Scholars write that a "Clan Mother," Jigonsaseh, was also a co-founder of the Confederacy. 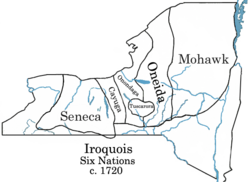 The tribes that united were Cayuga, Mohawk, Oneida, Onondaga, and Seneca. The purpose for the uniting was to end the inter-tribal wars and bring peace and well-being to all of the tribes. A sixth tribe, the Tuscarora, joined later after the confederacy was formed. The Cayuga, as well as other Iroquois tribes, met white explorers in the sixteenth century. In 1656, Jesuit missionaries Joseph Chaumanot and René Menard came to the area from Onondaga territory, said to be invited by the Cayuga chief Saonchiogwa. They were followed later by Étienne de Carheil and Pierre Raffeix. The Jesuits built the first Christian church west of Onondaga territory in Goiogouen, which they called Saint Joseph. Goiogouen, also known as Cayuga Castle, was a major village of the Cayuga. It was located on the eastern shore of Cayuga Lake on the north side of the Great Gully Brook, about ten miles south of the large seventeenth-century Cayuga town of Tiohero; and approximately along the southern line of the modern-day township of Springport, New York. It was located about four miles north from Chonodote, the present-day location of the village of Aurora, New York and about two miles south of the village of Union Springs, New York. Goiogouen is the fairest country I have seen in America. It is a tract between two lakes and not exceeding four leagues in width, consisting of almost uninterrupted plains, the woods bordering it are extremely beautiful. Around Goiogouen there are killed more than a thousand deer annually. Fish, salmon, as well as eels and other fish are plentiful. Four leagues from here I saw by the side of a river (Seneca) ten extremely fine salt springs. At the time of the American Revolution, Goiogouen consisted of "fifteen very large square log houses" (longhouses), deemed to be very well built by the scouting parties of the Sullivan-Clinton Campaign; and "in the vicinity… were one hundred and ten acres of corn; besides apples, peaches, potatoes, turnips, onions, pumpkins, squashes and other vegetables in abundance." The village was destroyed by these American troops on September 23, 1779. Chonodote was an eighteenth-century village of the Cayuga, located about four and a half miles from Goiogouen. Earlier, during the seventeenth century, this village was known as Deawendote, or "Village of the Constant Dawn." Archaeological digging has pinpointed the likely location of Chonodote on the northern end of Aurora. Potsherds have been found and evidence of the use of coal in the 1770s was discovered. As remorseless as a cannon shot, the axe leveled every tree though burdened with its loads of luscious fruit, and the freshly ripened corn was gathered only to be destroyed. At 10 o'clock a.m., the torch was applied to the dwellings, and as the crackling flames lifted their fiery heads over this scene of havoc and destruction. The Cayuga became involved in fur trade with the French during the seventeenth and eighteenth centuries, going to war over trapping territories as far south as Virginia. During the American Revolutionary War, the alliance split loyalty between the British and anti-British factions. Most Cayuga sided with the English. After the British defeat many Cayuga moved to Canada where they were given land in recognition of their loyalty to the Crown. On November 11, 1794, the (New York) Cayuga Nation (along with the other Haudenosaunee nations) signed the Treaty of Canandaigua with the United States. The treaty established peace and friendship between the United States of America and the Six Nations of the Iroquois (Haudenosaunee), and affirmed Haudenosaunee land rights in New York State. By 1807, all Cayuga land in the U.S. was sold. Some New York Cayuga moved to Ohio in the early 1800s. Later, they were moved to Wisconsin and Oklahoma. The Seneca and Cayuga incorporated together in 1937 under Oklahoma law. According to Cayuga tradition, a supreme creator, Orenda, was recognized in the festivals held for harvest, maple sap, strawberries, and corn. An eight-day event in midwinter was held to forgive past wrongs. In the early nineteenth century the teachings of Handsome Lake became popular among Cayuga. Handsome Lake was a Seneca who taught about Jesus and also blended the traditional celebrations with Christian-style confessions of sin and urged Native Americans to stay away from alcohol. His teachings eventually were incorporated into the Longhouse religion, which continues to have followers today. There were 50 chiefs (Sachems) of the Iroquois League. All the chiefs were men. The Cayuga sent ten men to the great council each fall. The Great Pipe was the symbol of their gathering. The Cayuga belonged to the "younger brother" division. There was a chief or headman in each village. The decision at all levels was based on consensus, which included women who could act as regents. There were nine known clans of Cayuga composed of matrilineal, animal-named family groups. Women enjoyed a high level of prestige and were in charge of village events including marriage. Sports included gambling. Shamans cured with a variety of medicinal plants including tobacco. The dead were placed in sitting position with tools and food for the afterlife. Suicide was a method of addressing loss of status or honor. Today, there are three Cayuga bands and the combined Seneca-Cayuga in Oklahoma. The two largest, the Lower Cayuga and Upper Cayuga, still live in Ontario, both at Six Nations of the Grand River. Only a small number remain in the United States - the Cayuga Indian Nation of New York in Versailles, New York State. Two federally recognized tribes of Cayuga are in the United States: the Cayuga Nation of New York in Seneca Falls, New York, and the Seneca-Cayuga Tribe of Oklahoma. In September 2000, Wells College in Aurora held a festival, Return to Chonodote, honoring the area's Haudenosaunee past and present. The event was co-sponsored by SHARE, members of the Cayuga Nation and Onondaga Nation, and Ithaca College. The Cayuga Indian Nation of New York currently does not have a reservation of its own and its members live among those of the Seneca nation. In 2005 the Cayuga purchased approximately 130 acres of land on the open market in Cayuga County, New York and Seneca County, New York. Shortly after the purchase of this land the Cayuga applied to the U.S. Bureau of Indian Affairs to have it taken into trust. The State of New York opposed this application asserting that the U.S. Bureau of Indian Affairs lacks the authority to take the land into trust under the Indian Reorganization Act of 1934. The symbol of the Iroquois nation is found in the reemergence of "Hiawatha's Belt." "In modern times, what was once a wampum belt, now is reborn as a flag. Seen both in Canada and the United States, the blue flag bearing the symbol of the unity of the five nations has become a rallying symbol for Iroquois of all tribes." On November 19, 1980 in the United States District Court for the Northern District of New York the Cayuga Indian Nation of New York commenced an action to reclaim land that allegedly was taken from it without the approval of the United States. In 1981, the Seneca-Cayuga Tribe of Oklahoma was added as a plaintiff in the claim. The jury returned a verdict in favor of the Cayuga Indian Nation of New York and the Seneca-Cayuga Tribe of Oklahoma finding current fair market value damages of $35 million and total fair rental value damages of $3.5 million. The jury gave the State a credit for the payments it had made to the Cayugas, of about $1.6 million, leaving the total damages at this stage at approximately $36.9 million. On October 2, 2001 the court issued a decision and order which awarded a prejudgment interest award of $211 million and a total award of $247.9 million. Both the plaintiffs and the defendants appealed this award and on June 28, 2005 the United States Court of Appeals for the Second Circuit rendered a decision that reversed the judgment of the trial court and entered a judgment in favor of the defendants.. The Cayuga Indian Nation of New York sought review of this decision by the Supreme Court of the United States but were denied; as a result, the Cayuga Indian Nation land claim is officially over. The total number of Iroquois (Haudenosaunee) today is hard to establish. 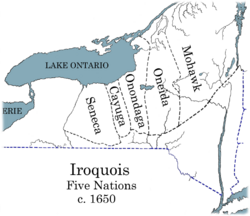 About 45,000 Iroquois lived in Canada in 1995. In the 2000 census, 80,822 people in the United States claimed Iroquois ethnicity, with 45,217 of them claiming only Iroquois background. However, tribal registrations in the United States in 1995 numbered about 30,000 in total. The Cayuga of New York State make up less than 500 of this total. There are also close to 5,000 combined members of the Cayuga-Seneca Nation in Oklahoma. ↑ Ohwejagehka: Ha`degaenage. www.ohwejagehka.com. Retrieved on August 20, 2007. ↑ S. Krech, 2005. "Shades of Hiawatha: Staging Indians 1880 - 1930," Journal of Social History 39(2): 550. Retrieved from Questia.com on August 26, 2007. ↑ B. Mann, 1997. "The Lynx in time Haudenosaunee Women's Tradition and History," American Indian Quarterly 21. Retrieved from Questia.com on August 26, 20007. ↑ Constitution of the Iroquois Nations: The Great Binding Law, Gayanashagowa. www.constitution.org. Retrieved on July 23, 2007. ↑ The Six Nations of the Iroquois, Herald American archives from July 22, 1990. www.tuscaroras.com. Retrieved on August 20, 2007. ↑ New York State Department of Environmental Conservation Cayuga Indian Nation Request to Take Land into Trust Retrieved on August 20, 2007. ↑ New York State Department of Environmental Conservation New York State's Comments Regarding Trust Application. Retrieved on August 20, 2007. ↑ Cayuga Nation.www.tuscarora.com. Retrieved on August 20, 2007. ↑ United States Court of Appeals for the Second Circuit. Retrieved on August 20, 2007. How the Sullivan-Clinton Campaign Dispossessed the Cayuga. Access Geneology: Indian Tribal Records Cayuga Indian Tribe History. This page was last modified on 19 January 2017, at 16:41.